We are proud to be an AAHA Accredited hospital. We are also a Cat Friendly Certified Practice & a Fear Free Certified Practice! Welcome to Ottawa Animal Hospital! Ottawa Animal Hospital is a full-service, AAHA accredited and Fear Free certified veterinary medical facility, located in Holland, MI. We are committed to promoting responsible pet ownership, preventative health care and health-related educational opportunities for our clients. Your pets’ health and well being are very important to us, and we take every possible measure to give your animals the care they deserve. With our five skilled doctors on staff, we have over 100 years of veterinary experience to utilize for our patients. Please take a moment to contact us today, to learn more about our veterinary practice and to find our more information about how Ottawa Animal Hospital can serve the needs of you and your cherished pet. If you have any questions, call (616) 399-2540 / (616) 396-7420 or email us and we'll promptly get back to you. At Ottawa Animal Hospital, you will find a warm heart for a cold nose. It is our mission to provide comprehensive, high-quality veterinary care with an emphasis on exceptional client service and patient care. Our motto is to treat every client as though they were family and every pet as if they were our own. Dr. Heitman has been the owner of Ottawa Animal Hospital since 1989. He graduated from Michigan State University School of Veterinary Medicine. Dr. Diane Bergstrom graduated from Michigan State University's Veterinary School in 1989. Dr. Swift graduated in 1996 from Michigan State University with a degree in Animal Behavior and Neurobiology and again in May of 2000 with her Doctorate of Veterinary Medicine. Dr. Susan Turner graduated veterinary school in 2009 from the University of Pennsylvania. Dr. Zimmerman graduated from Michigan State University College of Veterinary Medicine in 2003. Anneliese established her career in veterinary medicine in 2005 and she began managing veterinary clinics in 2014. Robin is a graduate of GVSU with a degree in Bio-medical Sciences. John joined our team as a kennel assistant in 2001 and has progressed to be a veterinary technician. Emily has been a LVT at Ottawa Animal Hospital for 11 years. Sara has worked at Ottawa Animal Hospital since August of 2012. Julie is a Licensed Veterinary Technician who graduated from Michigan State University. Brianna started working with the Ottawa Animal Hospital family in October of 2013. Amanda was born and raised in Boston, MA where she worked for a small animal veterinary clinic. Amanda began working in the veterinary field in 2015, and has worked in both general practice and emergency medicine. Dar was added to our team in October of 2018. Kylie recently joined our team in November of 2018. Maggie has worked in the veterinary industry for 20 years. Jami has been in the veterinary field since 2000. She has worked as both a vet assistant and in client service. Alyssa started at Ottawa Animal Hospital as a kennel technician and is now a client service specialist. Tanja has been in the veterinary field for almost 7 years. Holly joined the Ottawa Animal Hospital team in the spring of 2018. Samantha has been in the veterinary field since 2010. Stephanie was born and raised in the Holland/Zeeland area. Khaitlin started as a kennel assistant in August of 2018. "This place is awesome! I have been to over 6 vets within the last few years and I keep coming back here, despite me having to drive an hour to get to this office. I love how they call to check up on your pet when they are sick or had an issue. In fact, my boyfriend just brought his puppy here because of the good service he saw that I received with my two dogs. I will always highly recommend OAH!" "We've gone through many vets. We've never been more satisfied and sound in anything than we are in our decision to bring our family here. From the beginning we were treated with respect and our pets with love. The expertise provided through MSU and this office helped us diagnose, and ultimately treat our Gallagher! As rare as the condition was, within a couple weeks and a visit from a specialist, he looked better than we have ever seen him look! We take him every 5 weeks for shots now and as rough and tough as he sounds and acts, they have no fear. We are in and out of there." "Ottawa Animal Hospital is great!! The staff is very knowledgeable and the doctors are great!! They have various treatment options for all conditions and provide excellent year round care for my cat. I recommend them to everyone that is looking for a place to take their pets!!" "Thank you so much for your wonderful care of our handsome boy Levi, over the past 6 years. I would highly recommend Ottawa Animal Hospital, they go above and beyond with the care of our precious fur-babies. Very caring place and they even make follow-up calls to see how their patient is doing." them. Thank you guys for everything you do!" Dr. Heitman had to pass approximately 954 tests!! How many vets do you know who care this much about your pet (s)? Dr. Heitman's Ottawa Animal Hospital is outstanding! They stand out in West Michigan & the Eastern half of the USA! Thank you Dr. Heitman!" most important dog to them. I believe they do everything possible to help find the problem and then treat that problem the best that they can. I love that. I wouldn't go anywhere else." 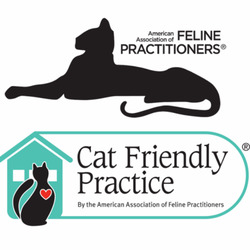 We are AAHA accredited, a Fear Free Certified Practice, and a Cat Friendly Practice.